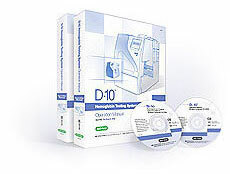 The D-10™ Hemoglobin Testing System provides comprehensive hemoglobin testing in a compact footprint. This fully automated system combines diabetes monitoring and -thalassemia testing on a single platform. 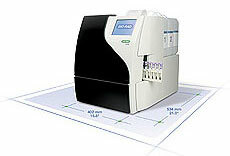 Select programs for fast HbA1c or HbA2/F/A1c quantitation to meet your workflow needs. The D-10 offers simple and efficient operation for clinics, physician offices or clinical laboratories. 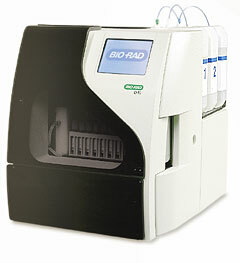 Whole blood primary tube sampling eliminates off-line sample preparation. Touch screen operation and automatic sample bar code reading increase ease-of-use. This automated high-performance liquid chromatography platform sets a new standard of performance for comprehensive hemoglobin testing. The D-10 is easy to learn and use. A multi-language CD-ROM of the operation manual is included with each system. The CD includes Danish, English, French, German, Italian, Portuguese, Spanish and Swedish languages. Each system comes with an interactive training CD. This user-friendly tool allows you to learn about the instrument in a step-by-step fashion. At only 15.8 inches by 21.0 inches (402 mm x 534 mm) the D-10 requires a minimum amount of laboratory space. This provides more room for other important day-to-day operations.